General Ronald Coleman and Frank Giordano leading procession. Most people have heard of “Christmas in July”. It’s become a fun opportunity for people to throw a themed party in the summer (and a popular gimmick for retailers!). Well this past summer, July 2014, The Philly POPS threw a press conference in the form of a spectacular party. As the PR Consultants for The Philly POPS, we were tasked with announcing an exciting new program created by the President of The Philly POPS, Frank Giordano. 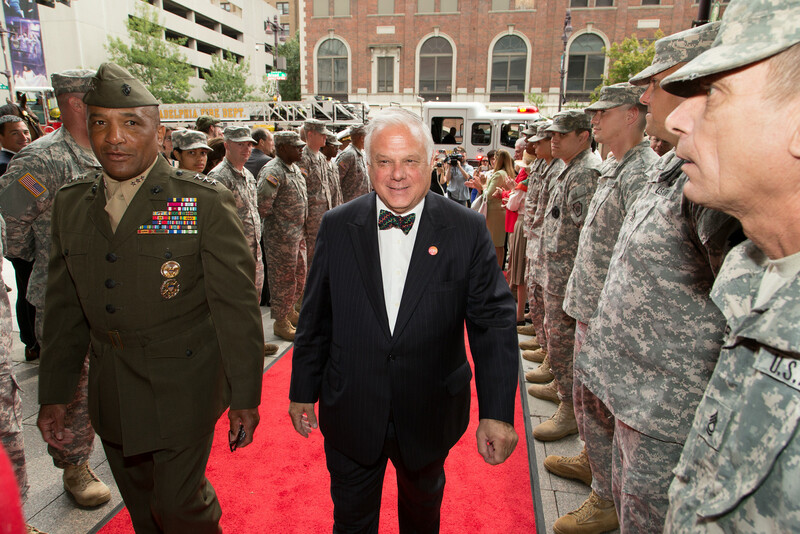 We are going to honor the local military and first responders on December 5, 2014 as we launch The Philly POPS nine-concert Christmas Spectacular series with the I’ll Be Home for Christmas Spectacular – A Salute to the Military and First Responders concert. 2,000 free tickets will be given to local military personnel through Liberty USO and to Philadelphia police officers and firefighters. In order to announce this concert, Frank challenged us to create a press conference as spectacularly as possible. We gladly accepted the challenge by creating the Christmas in July Parade that began at the Union League and ended at the Kimmel Center where the press conference would take place. We worked closely with the Philadelphia Police and Fire Departments. The Police shut down the south side of Broad Street and offered us an official Highway Patrol Motorcade to lead the parade while the Fire Department brought two fire engines (a 30’ and 55’ ladder engine) to be in the parade. Liberty USO recruited two military personnel to hold a large banner at the front of the parade. Riding in the fire engines were Frank Giordano, Lieutenant General (retired) Ronald S. Coleman of the United States Marine Corps and, of course, Santa and Mrs. Claus! 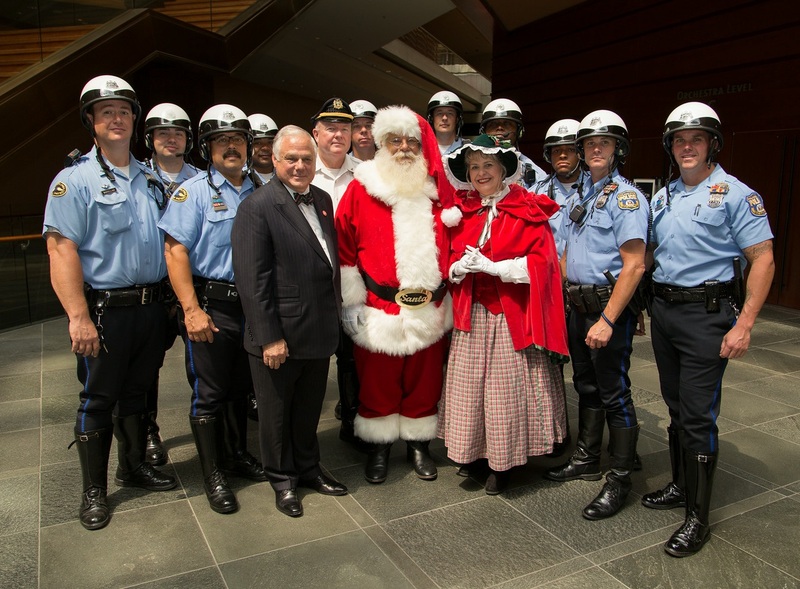 Frank Giordano, Santa, Mrs. Claus and Philadelphia Police. It was truly a spectacular sight. Not to mention the ceremony the Highway Patrol motorcade parking information and dismounting their motorcycles on the sidewalk out front of the Kimmel Center. We then paraded everyone inside the Kimmel Center, led by the Bravo Brass playing a Christmas song, where they were met with another great visual. There were Christmas Trees with patriotic décor on both sides of the stage, a historic 1964 Harley Davidson police motorcycle on display, over 20 members of the Police and Fire Department lining both sides of the stage, Christmas themed refreshments and all attendees received a gift from The Philly POPS that included a Christmas ornament. The press conference itself was a party. In addition to our special guests seated on the stage, members of the Philly POPS Festivus Chorus joined us and sang three holiday songs throughout the short conference. It was a great success. The press conference ran on CBS, NBC, 6abc, WPHL, KYW Newsradio, CBSphilly.com and it was the Philadelphia Inquirer Photo of the Day on July 11, 2014. Of course, we would be remiss if we didn’t remind everyone that the I’ll Be Home For Christmas Spectacular concert is the launch of The Philly POPS Christmas Spectacular concert series taking place from December 6th through 20th with the celebrated guest conductor David Charles Abell and guest singer Hugh Panaro, a recent Phantom in Broadway’s Phantom of the Opera. Tickets can be purchased at www.phillypops.com or by calling 215.893.1999. This post was written by Hope Horwitz. Hope is an Account Executive at Sharla Feldscher Public Relations. This entry was posted in Events and tagged Case Studies, Case Study, Christmas, Events, Holidays, July, Philadelphia, Philly Philadelphia, PR, Public Relations, The Philly Pops by pprablog. Bookmark the permalink.